The North liveaboard route or wreck tour starts from Hurghada to go North till the entry of the gulf of Suez where the wrecks like Thislegorm and Dunraven are. A visit of the Ras Mohamed marine park will be on the program. On the way North and and the way back you will visit the best dive sites of Hurghada like Erg Somaya - Ston beach- small Giftun Isl. 65 km South of Hurghada the quality of diving increases already. This liveaboard route has the advantage of being in a protected area and for this reason can offer easy conditions for less experienced divers who will be diving miao miao dive sites like Abu Kifan - Panorama reef - Shab Sher . wall diving along their whole perimeter and the possibility to spot a wide variety of pelagics. Their walls are covered in soft corals of all colours, black corals and forests of fan corals creating a true feast for the eyes. Big tuna, shoals of jack fish and snappers cruise in the blue accompanied by hammerhead, grey reef, silver-tip, silky and oceanic white-tip sharks and mantas. The Longimanus shark, an oceanic species, circles the walls of the Brothers on a regular basis. The northerly of the two island and has a small lighthouse. It has two wrecks lying on its walls. At the northern most tip of the island lays a large freighter named the Namibia the other is the Aida II an Egyptian supply vessel that struck at night. There is excellent wall diving all along the southern side of the reef with strong currents promoting the growth of a spectacular forest of soft corals. Frequent sightings of big pelagics and an astonishing variety of marine life. A narrow reef table round the island's shore gives way almost immediately to a sheer vertical wall, dropping well past the limits of sport diving. a wealth of soft corals of every conceivable species flourish in the big currents. The stony corals are also well represented. Definitely rank among the best dive sites in the Red Sea. North of Marsa Alam to dive Elphinstone reef one of the top dive sites in the deep South. the dolphin dive of Samadai area are. Deadalus; Zabargad; Rocky Island and St. Johns. 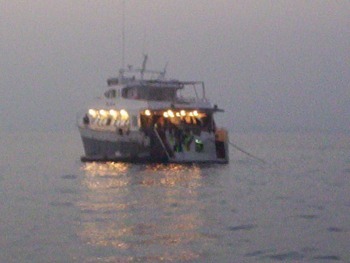 If you have the opportunity to join one of those itineraries you will dive from one top dive site to another. This liveaboard route has long distances of sailing . Best time is April till November for weather conditions and May June for pelagics and sharks. like the dolphin dive of Samadai all the way down to St. Johns.